Download "907 KAR 9:005. Level I and II psychiatric residential treatment facility service and coverage policies." 4 2. At least two (2) years work experience in a psychiatric inpatient or residential treatment setting for children. (16) "Physician" is defined by KRS (12). 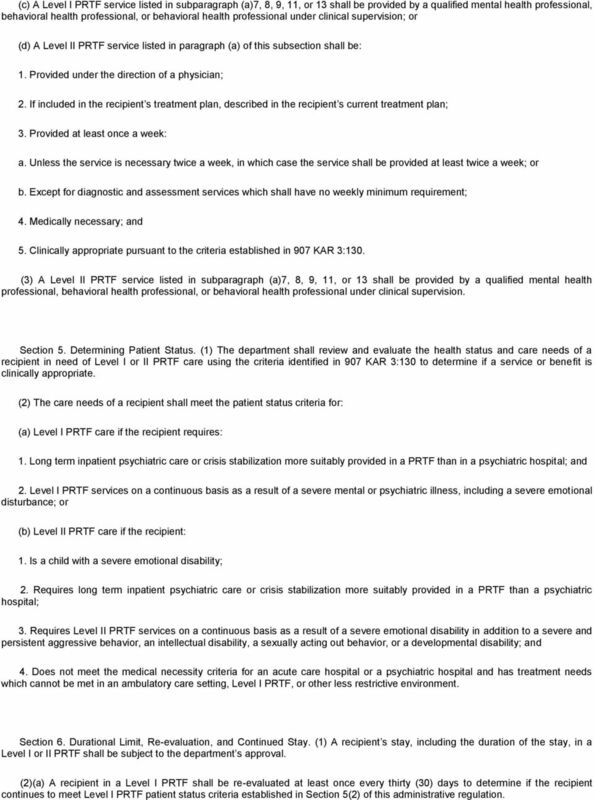 (17) "Private psychiatric hospital" is defined by KRS (2). 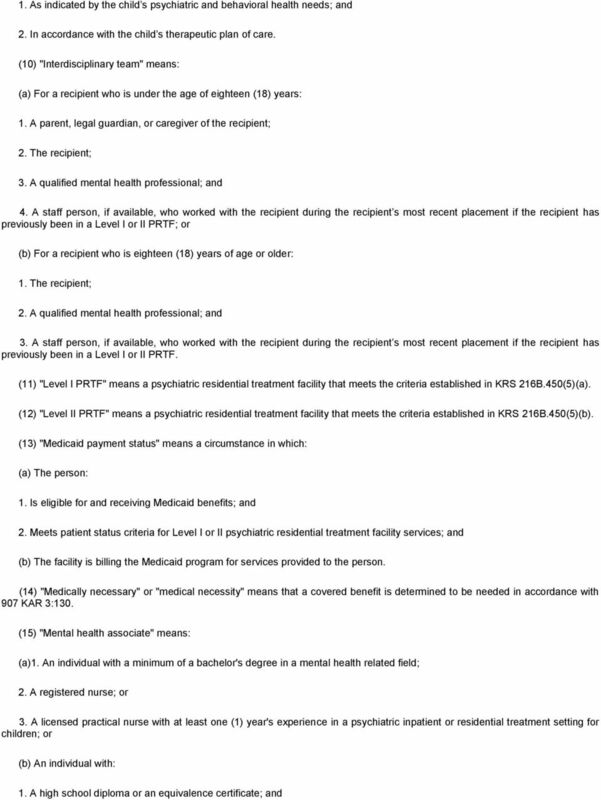 (18) "Psychiatric residential treatment facility" or "PRTF" is defined by KRS 216B.450(5). 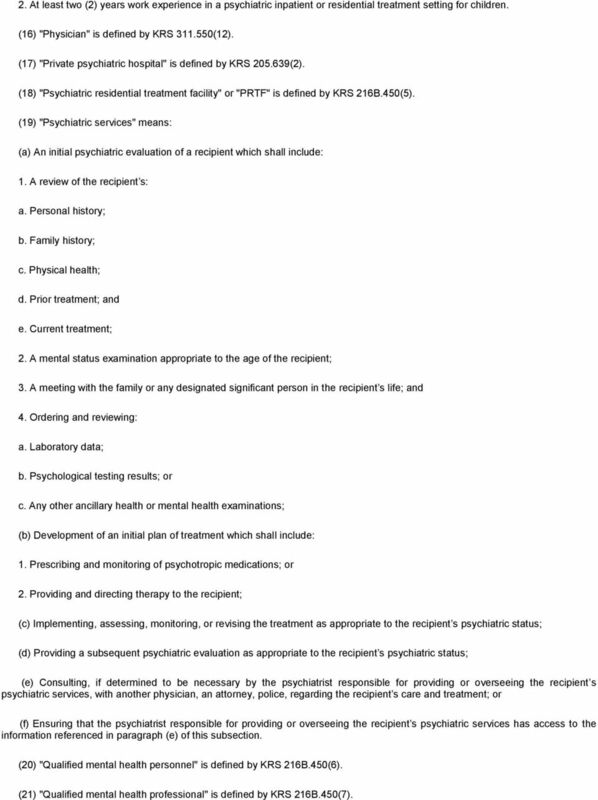 (19) "Psychiatric services" means: (a) An initial psychiatric evaluation of a recipient which shall include: 1. A review of the recipient s: a. Personal history; b. Family history; c. Physical health; d. Prior treatment; and e. Current treatment; 2. A mental status examination appropriate to the age of the recipient; 3. A meeting with the family or any designated significant person in the recipient s life; and 4. Ordering and reviewing: a. Laboratory data; b. Psychological testing results; or c. Any other ancillary health or mental health examinations; (b) Development of an initial plan of treatment which shall include: 1. Prescribing and monitoring of psychotropic medications; or 2. 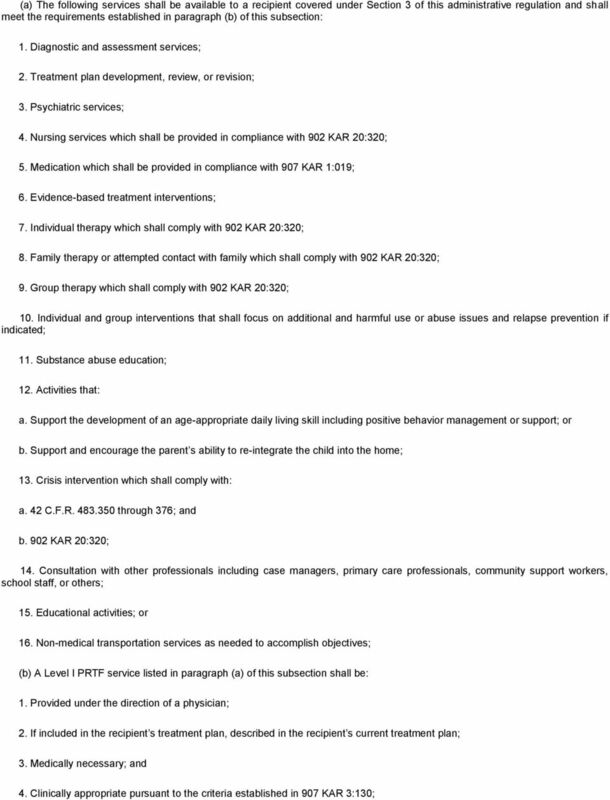 Providing and directing therapy to the recipient; (c) Implementing, assessing, monitoring, or revising the treatment as appropriate to the recipient s psychiatric status; (d) Providing a subsequent psychiatric evaluation as appropriate to the recipient s psychiatric status; (e) Consulting, if determined to be necessary by the psychiatrist responsible for providing or overseeing the recipient s psychiatric services, with another physician, an attorney, police, regarding the recipient s care and treatment; or (f) Ensuring that the psychiatrist responsible for providing or overseeing the recipient s psychiatric services has access to the information referenced in paragraph (e) of this subsection. 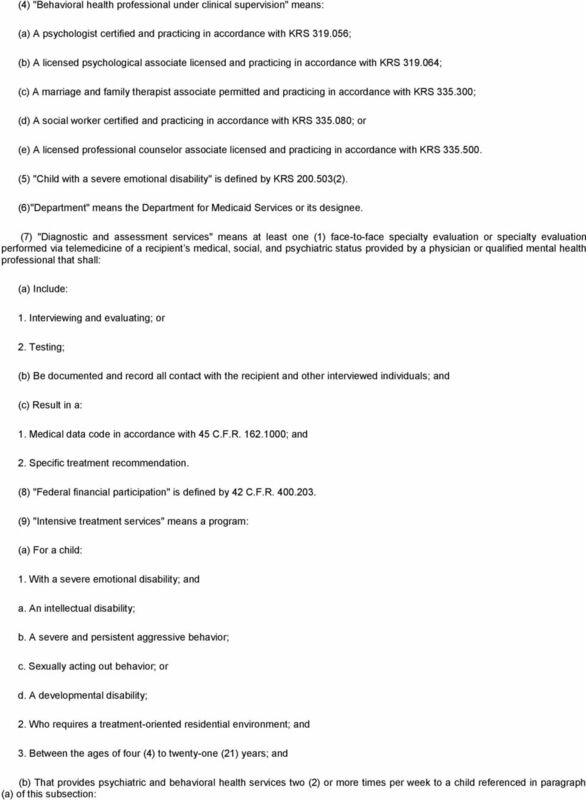 (20) "Qualified mental health personnel" is defined by KRS 216B.450(6). 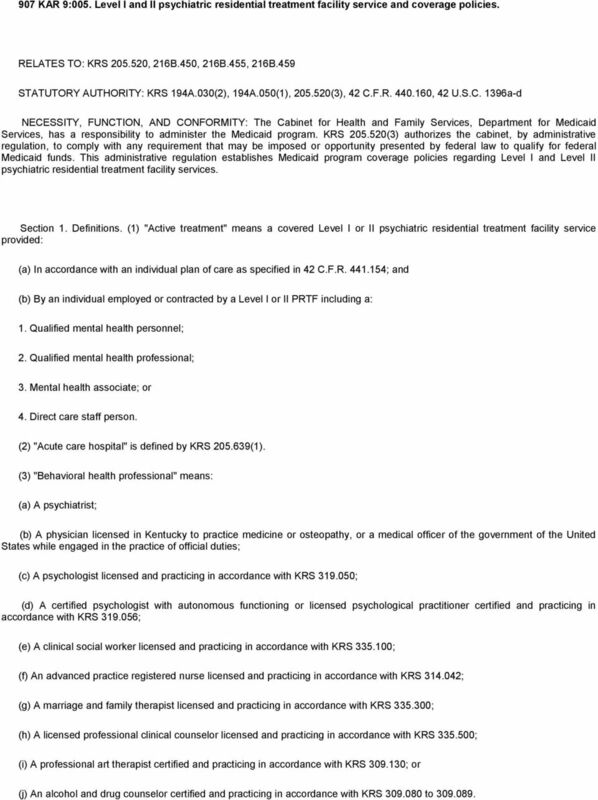 (21) "Qualified mental health professional" is defined by KRS 216B.450(7). 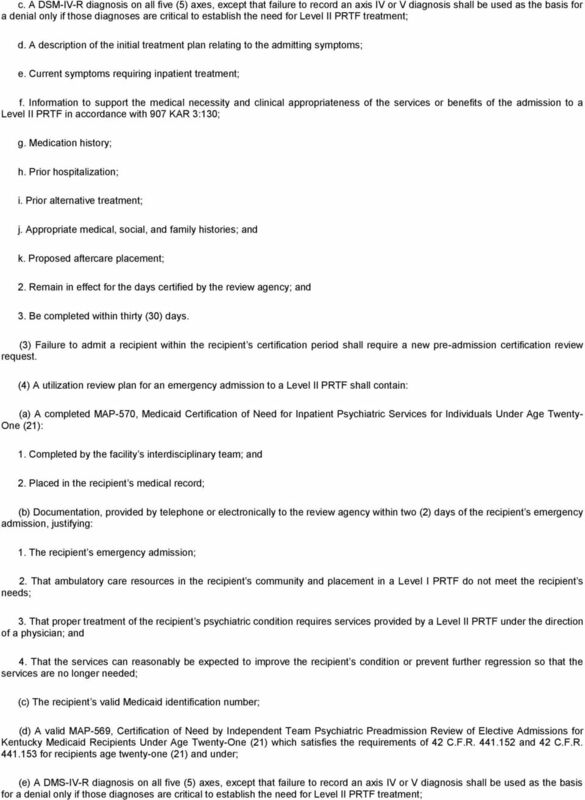 12 (c) A Level I PRTF service listed in subparagraph (a)7, 8, 9, 11, or 13 shall be provided by a qualified mental health professional, behavioral health professional, or behavioral health professional under clinical supervision; or (d) A Level II PRTF service listed in paragraph (a) of this subsection shall be: 1. Provided under the direction of a physician; 2. If included in the recipient s treatment plan, described in the recipient s current treatment plan; 3. Provided at least once a week: a. Unless the service is necessary twice a week, in which case the service shall be provided at least twice a week; or b. Except for diagnostic and assessment services which shall have no weekly minimum requirement; 4. Medically necessary; and 5. Clinically appropriate pursuant to the criteria established in 907 KAR 3:130. 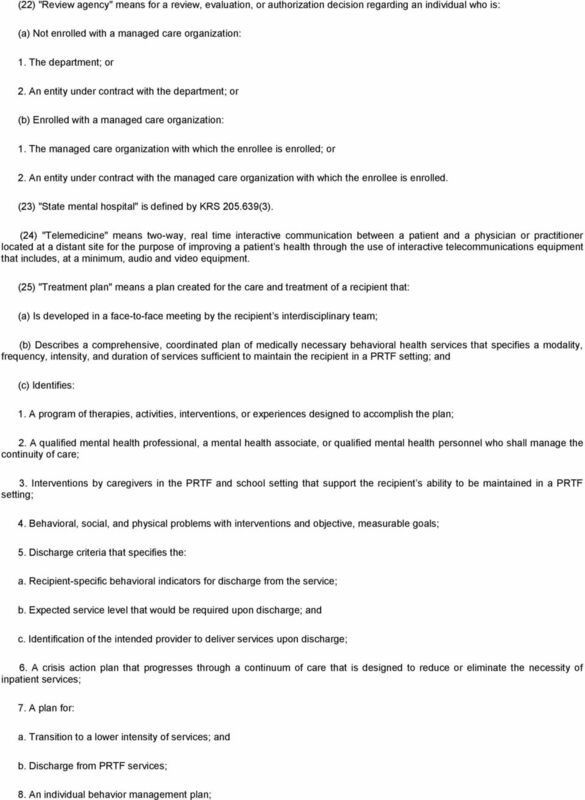 (3) A Level II PRTF service listed in subparagraph (a)7, 8, 9, 11, or 13 shall be provided by a qualified mental health professional, behavioral health professional, or behavioral health professional under clinical supervision. Section 5. Determining Patient Status. (1) The department shall review and evaluate the health status and care needs of a recipient in need of Level I or II PRTF care using the criteria identified in 907 KAR 3:130 to determine if a service or benefit is clinically appropriate. (2) The care needs of a recipient shall meet the patient status criteria for: (a) Level I PRTF care if the recipient requires: 1. Long term inpatient psychiatric care or crisis stabilization more suitably provided in a PRTF than in a psychiatric hospital; and 2. Level I PRTF services on a continuous basis as a result of a severe mental or psychiatric illness, including a severe emotional disturbance; or (b) Level II PRTF care if the recipient: 1. Is a child with a severe emotional disability; 2. Requires long term inpatient psychiatric care or crisis stabilization more suitably provided in a PRTF than a psychiatric hospital; 3. Requires Level II PRTF services on a continuous basis as a result of a severe emotional disability in addition to a severe and persistent aggressive behavior, an intellectual disability, a sexually acting out behavior, or a developmental disability; and 4. Does not meet the medical necessity criteria for an acute care hospital or a psychiatric hospital and has treatment needs which cannot be met in an ambulatory care setting, Level I PRTF, or other less restrictive environment. Section 6. Durational Limit, Re-evaluation, and Continued Stay. (1) A recipient s stay, including the duration of the stay, in a Level I or II PRTF shall be subject to the department s approval. (2)(a) A recipient in a Level I PRTF shall be re-evaluated at least once every thirty (30) days to determine if the recipient continues to meet Level I PRTF patient status criteria established in Section 5(2) of this administrative regulation. 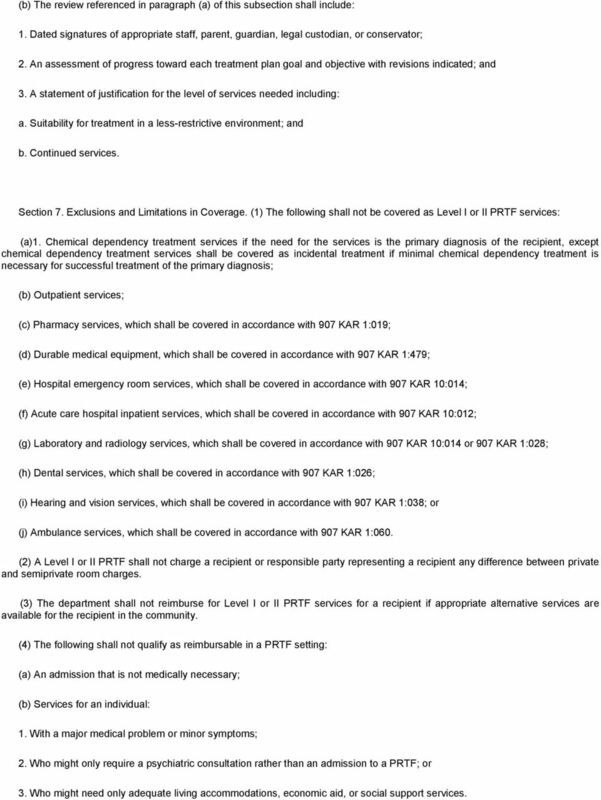 13 (b) A Level I PRTF shall complete a review of each recipient s treatment plan at least once every thirty (30) days. (c) The review referenced in paragraph (b) of this subsection shall include: 1. Dated signatures of: a. Appropriate staff; and b. If present for the treatment plan meeting, a parent, guardian, legal custodian, or conservator; 2. An assessment of progress toward each treatment plan goal and objective with revisions indicated; and 3. A statement of justification for the level of services needed including: a. Suitability for treatment in a less-restrictive environment; and b. Continued services. (d) If a recipient no longer meets Level I PRTF patient status criteria, the department shall only reimburse through the last day of the individual s current approved stay. (e) The re-evaluation referenced in paragraph (a) of this subsection shall be performed by a review agency. 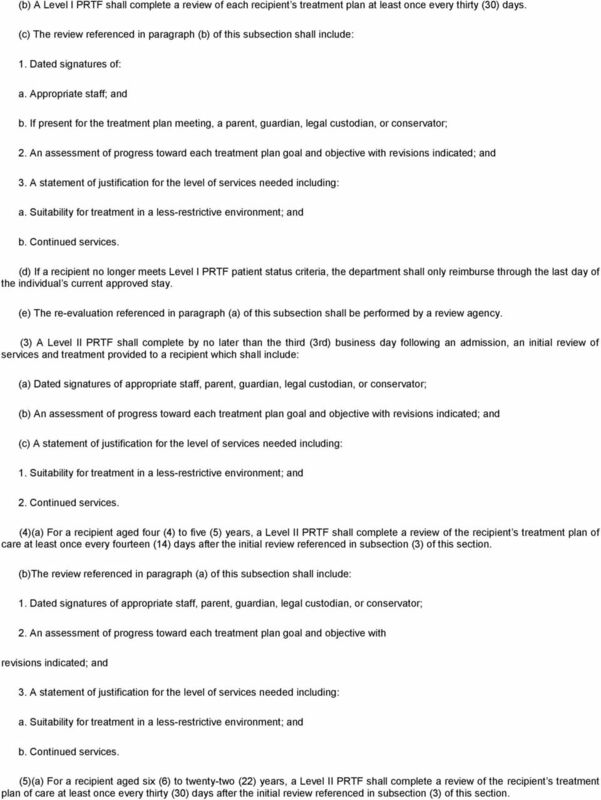 (3) A Level II PRTF shall complete by no later than the third (3rd) business day following an admission, an initial review of services and treatment provided to a recipient which shall include: (a) Dated signatures of appropriate staff, parent, guardian, legal custodian, or conservator; (b) An assessment of progress toward each treatment plan goal and objective with revisions indicated; and (c) A statement of justification for the level of services needed including: 1. Suitability for treatment in a less-restrictive environment; and 2. Continued services. (4)(a) For a recipient aged four (4) to five (5) years, a Level II PRTF shall complete a review of the recipient s treatment plan of care at least once every fourteen (14) days after the initial review referenced in subsection (3) of this section. (b)the review referenced in paragraph (a) of this subsection shall include: 1. Dated signatures of appropriate staff, parent, guardian, legal custodian, or conservator; 2. An assessment of progress toward each treatment plan goal and objective with revisions indicated; and 3. A statement of justification for the level of services needed including: a. Suitability for treatment in a less-restrictive environment; and b. Continued services. 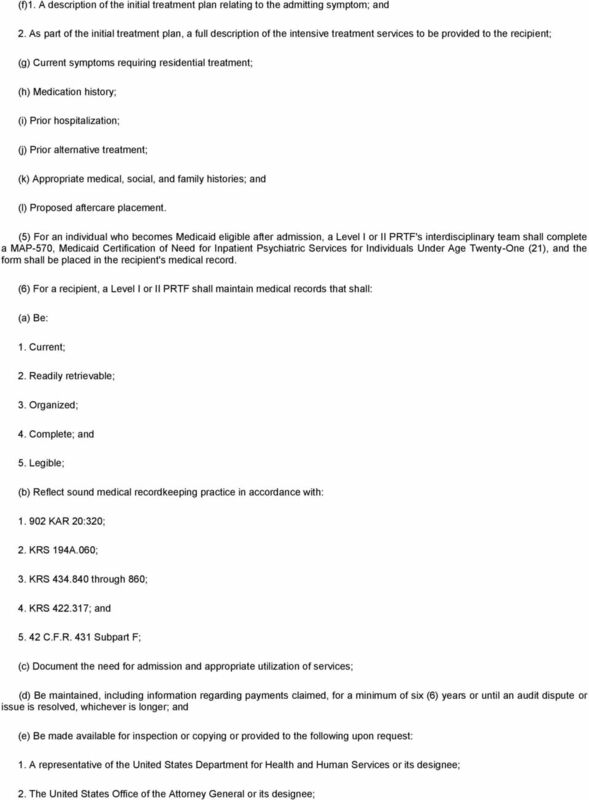 (5)(a) For a recipient aged six (6) to twenty-two (22) years, a Level II PRTF shall complete a review of the recipient s treatment plan of care at least once every thirty (30) days after the initial review referenced in subsection (3) of this section. 14 (b) The review referenced in paragraph (a) of this subsection shall include: 1. Dated signatures of appropriate staff, parent, guardian, legal custodian, or conservator; 2. An assessment of progress toward each treatment plan goal and objective with revisions indicated; and 3. A statement of justification for the level of services needed including: a. Suitability for treatment in a less-restrictive environment; and b. Continued services. Section 7. Exclusions and Limitations in Coverage. (1) The following shall not be covered as Level I or II PRTF services: (a)1. Chemical dependency treatment services if the need for the services is the primary diagnosis of the recipient, except chemical dependency treatment services shall be covered as incidental treatment if minimal chemical dependency treatment is necessary for successful treatment of the primary diagnosis; (b) Outpatient services; (c) Pharmacy services, which shall be covered in accordance with 907 KAR 1:019; (d) Durable medical equipment, which shall be covered in accordance with 907 KAR 1:479; (e) Hospital emergency room services, which shall be covered in accordance with 907 KAR 10:014; (f) Acute care hospital inpatient services, which shall be covered in accordance with 907 KAR 10:012; (g) Laboratory and radiology services, which shall be covered in accordance with 907 KAR 10:014 or 907 KAR 1:028; (h) Dental services, which shall be covered in accordance with 907 KAR 1:026; (i) Hearing and vision services, which shall be covered in accordance with 907 KAR 1:038; or (j) Ambulance services, which shall be covered in accordance with 907 KAR 1:060. (2) A Level I or II PRTF shall not charge a recipient or responsible party representing a recipient any difference between private and semiprivate room charges. (3) The department shall not reimburse for Level I or II PRTF services for a recipient if appropriate alternative services are available for the recipient in the community. (4) The following shall not qualify as reimbursable in a PRTF setting: (a) An admission that is not medically necessary; (b) Services for an individual: 1. With a major medical problem or minor symptoms; 2. Who might only require a psychiatric consultation rather than an admission to a PRTF; or 3. Who might need only adequate living accommodations, economic aid, or social support services. 15 Section 8. Reserved Bed and Therapeutic Pass Days. 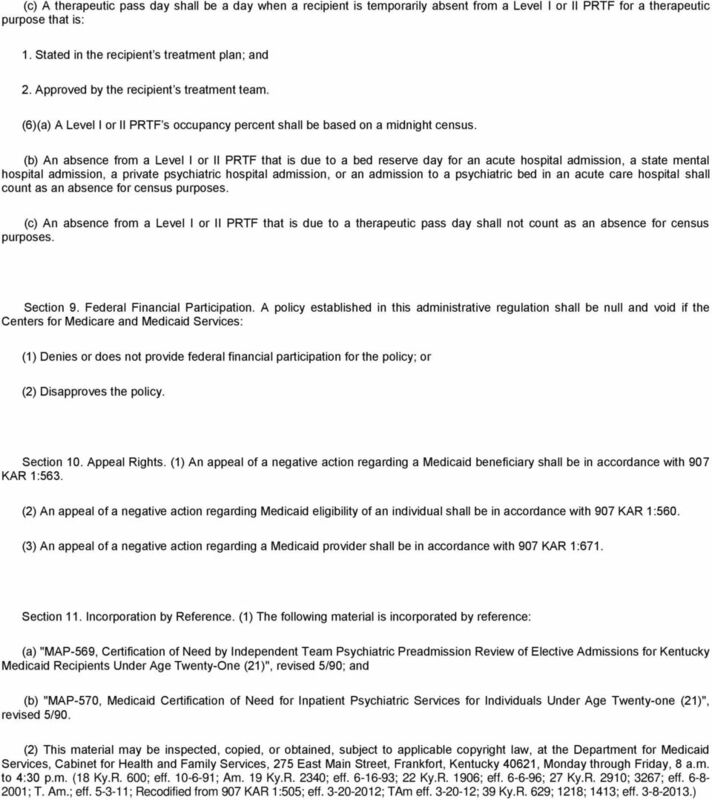 (1)(a) The department shall cover a bed reserve day for an acute hospital admission, a state mental hospital admission, a private psychiatric hospital admission, or an admission to a psychiatric bed in an acute care hospital for a recipient s absence from a Level I or II PRTF if the recipient: 1. 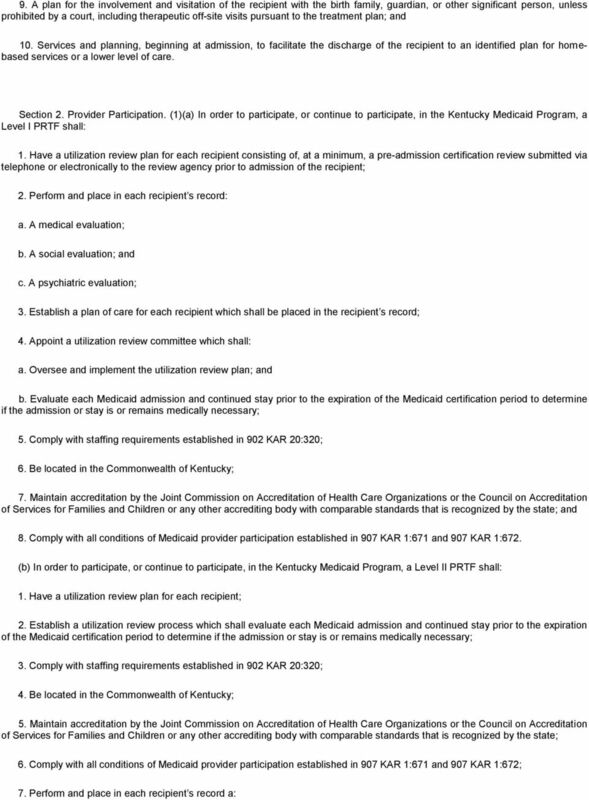 Is in Medicaid payment status in a Level I or II PRTF; 2. Has been in the Level I or II PRTF overnight for at least one (1) night; 3. Is reasonably expected to return requiring Level I or II PRTF care; and 4.a. Has not exceeded the bed reserve day limit established in paragraph (b) of this subsection; or b. Received an exception to the limit in accordance with paragraph (c) of this subsection. (b) The annual bed reserve day limit per recipient shall be five (5) days per calendar year in aggregate for any combination of bed reserve days associated with an acute care hospital admission, a state mental hospital admission, a private psychiatric hospital admission, or an admission to a psychiatric bed in an acute care hospital. (c) The department shall allow a recipient to exceed the limit established in paragraph (b) of this subsection, if the department determines that an additional bed reserve day is in the best interest of the recipient. (2)(a) The department shall cover a therapeutic pass day for a recipient s absence from a Level I or II PRTF if the recipient: 1. 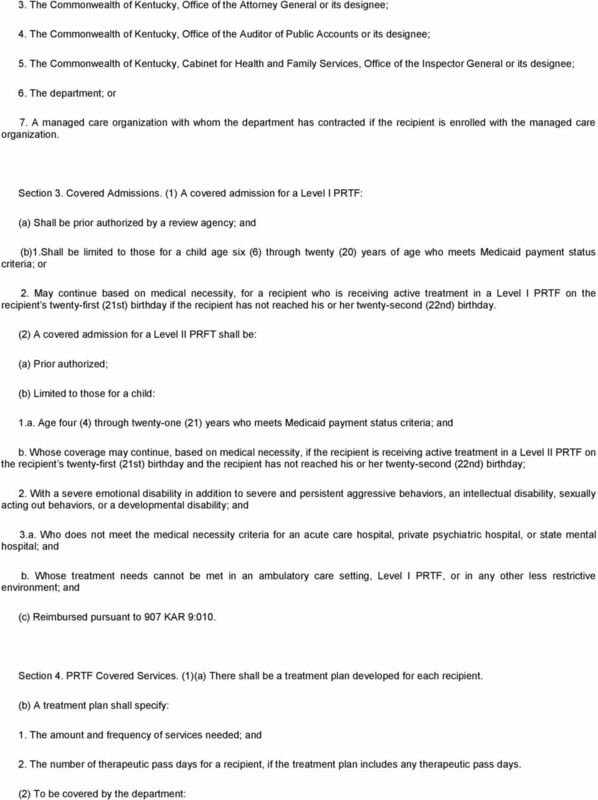 Is in Medicaid payment status in a Level I or II PRTF; 2. Has been in the Level I or II PRTF overnight for at least one (1) night; 3. Is reasonably expected to return requiring Level I or II PRTF care; and 4.a. Has not exceeded the therapeutic pass day limit established in paragraph (b) of this subsection; or b. Received an exception to the limit in accordance with paragraph (c) of this subsection. (b) The annual therapeutic pass day limit per recipient shall be fourteen (14) days per calendar year. 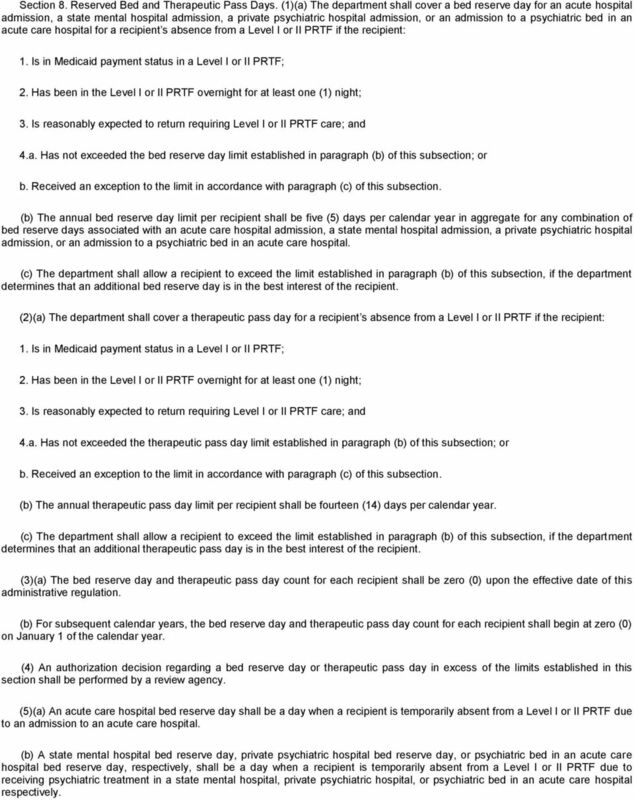 (c) The department shall allow a recipient to exceed the limit established in paragraph (b) of this subsection, if the department determines that an additional therapeutic pass day is in the best interest of the recipient. (3)(a) The bed reserve day and therapeutic pass day count for each recipient shall be zero (0) upon the effective date of this administrative regulation. (b) For subsequent calendar years, the bed reserve day and therapeutic pass day count for each recipient shall begin at zero (0) on January 1 of the calendar year. (4) An authorization decision regarding a bed reserve day or therapeutic pass day in excess of the limits established in this section shall be performed by a review agency. (5)(a) An acute care hospital bed reserve day shall be a day when a recipient is temporarily absent from a Level I or II PRTF due to an admission to an acute care hospital. (b) A state mental hospital bed reserve day, private psychiatric hospital bed reserve day, or psychiatric bed in an acute care hospital bed reserve day, respectively, shall be a day when a recipient is temporarily absent from a Level I or II PRTF due to receiving psychiatric treatment in a state mental hospital, private psychiatric hospital, or psychiatric bed in an acute care hospital respectively. 907 KAR 9:010. 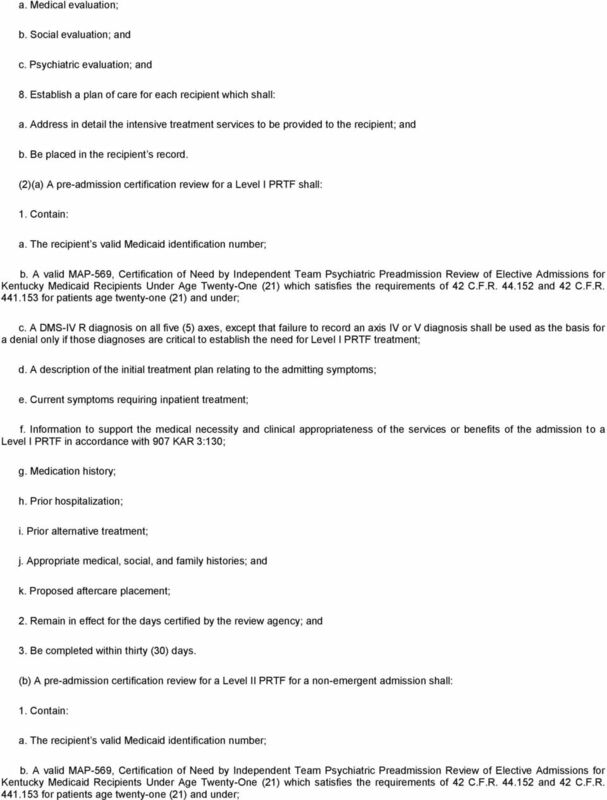 Reimbursement for Level I and II[Payments for ] psychiatric residential RELATES TO: KRS 205.520, 216B.450, 216B.455, 216B. 1. Clarification regarding whether an admission order must be completed before any therapy evaluations are initiated. Follow-up information from the November 12 provider training call I. Admission Orders 1. Clarification regarding whether an admission order must be completed before any therapy evaluations are initiated.